Wat Phra That Doi Geng Located at Moo 5, Tambon Tha Dua, Doi Tao far away from Doi Tao District, about 60 kilometers. This pagoda keep forehead bone of Buddha. The history says that. In 1200-1260. Chamadevi king of Hari Poonchai has been restored. Later in 2462 Siwichai renovated. 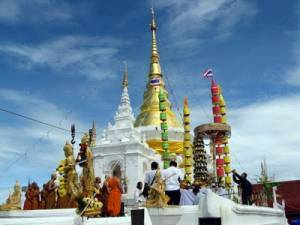 In the third lunar month, In Makha Bucha Day will has to pour water over the Buddha mock-up every year.